Madeline Pellicer and Ayanna Ravia are going to the Junior Olympics this summer. Back in 2006, the first junior roller derby league in the U.S was started here in Tucson. Ten years later, the sport is celebrating its inaugural year in the Junior Olympics, with two local Tucson skaters on the Team. Madeline Pellicer, 14, and Ayanna Ravia, 17, were both selected to be a part of the Southwest All Star Roller Derby team. 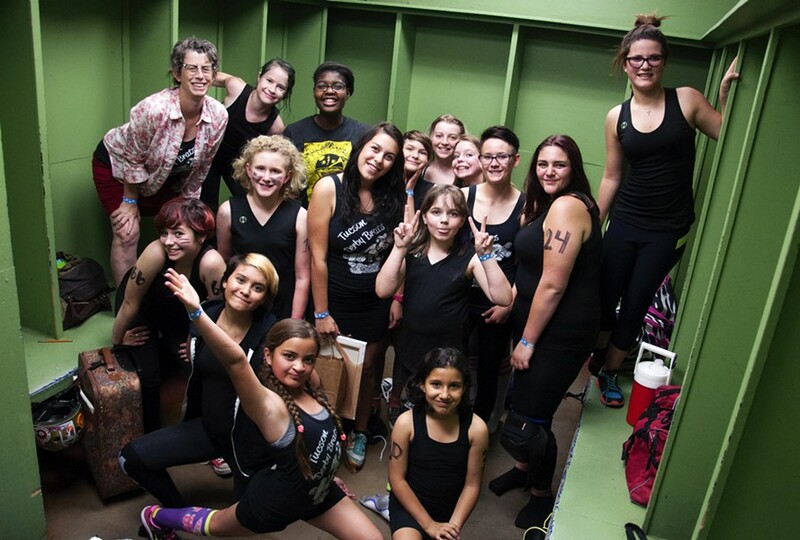 Under the skating aliases of Ayannic Storm and Madeline Bootyfly, they participate in the Tucson Junior Roller Derby League as well as the Phoenix Junior Roller Derby League. Ravia started skating back in 2010, when the daughter of her mother's co-worker introduced her to Roller Derby. Ravia said that roller derby appealed to her initially because she has no hand-eye coordination. She realized roller derby was for her when she saw a skater hop off the track, drop to her knees and slide in to get water. "I thought it was the most badass thing in the world," she said. "It was scary, it made a really loud sound and it sounded like she was breaking her legs." In 2008, Pellicer dressed as a roller derby girl for Halloween. A coach for the Tucson Derby Brats noticed her costume and asked her about joining the team. She took the coach up on the offer and has been skating ever since. "It's great to have two Tucson skaters actually make that team, considering this is the birthplace of Junior Roller Derby in the U.S.," said Michele Ream, board president of Tucson Derby Brats and Madeline's mother. As the parents watched their daughter's practice, they chatted about the success of the two girls. "The travel team they play for up in Phoenix, the Teen Terrors, really does deserves some credit in helping get to the Olympics," Jennifer Ravia said. The Amateur Athletic Union (AAU) has organized the Junior Olympics for the past 50 years. This year, the organization decided to partner with the Junior Roller Derby Association (JDRA) to bring the sport to the Junior Olympic Games. The first eight-team co-ed international event for Junior Roller Derby at the Junior Olympics will happen in conjunction with the JDRA Championship event. The championship will be held in Lincoln Nebraska on July 9-11 and the Olympics will immediately follow on July 12-13. "This is our dream," Ravia said. "There's super great players out there, better than I am. Being handpicked for the Olympics is just a really great accomplishment." Pellicer and Ravia were selected out of a pool of skaters who applied from eight regions, six of which are in the U.S. and two in Canada. If roller derby does become an Olympic sport, the players on the Junior Olympic teams are front-runners for the Olympic team. While the current push to include roller derby as well as other roller sports in future Olympic Games has been unsuccessful, the rapid growth and popularity of roller derby have fans hopeful the sport will be included soon. If that happens, Pellicer and Ravia might be part of the U.S Roller Derby team some day. The Tucson Derby Brats are always looking to recruit new girls 8-17. No prior skating skills are required. Fall registration night is 6:30 p.m. Tuesday, Aug. 30, at Catalina High School's skate rink. Ravia, who had no experience when she started, had high praise for her coaches. "When I started, we had a couple different coaches at every practice that would take the new girls down to the end to practice basic drills," she said. "I remember after a couple of weeks I had down my basic stops, and starts and falls, and basic things like that." The girls like the atmosphere and comradery in the sport. With a glance at Pellicer, Ravia said: "I can go beat her up, and she'll still be my friend next week."